The sprays help whether the behaviour is mild or extreme. Wonderful for stress, anxiety, and any fear issues. the sprays are 100% safe and organic and very easy to apply. We have a choice of Storm Fear, Firework & Noise, General Anxiety, Extreme Anxiety, Separation Anxiety, Travel Assistance, Barking, Rescue Dog, Grief. 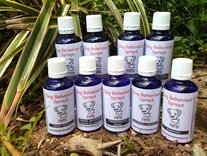 To help you and your dog further, we also supply full behaviour modificaion assistance, compiled by Scotty Valadao to further assist you and when you get in touch with us, will advise you further as to which spray would suit your pet the best.